Children are the future. We are only merely minding this earth for them. They are our future leaders, doctors, lawyers, presidents, mothers, fathers and politicians. Everything we do has to be to clear the path for them, the path to greatness, the path to a successful, fulfilled life. They don’t know it yet but amongst the youth is a future astronaut, future Olympic gold medallists and future world leaders. The future most powerful people in the world are running around our back gardens, laughing and smiling right now. Our children are precious, we need to make sure we nourish them and care for them properly. To begin the path to greatness, we need ensure we have them dressed for success in clothes that will turn heads. 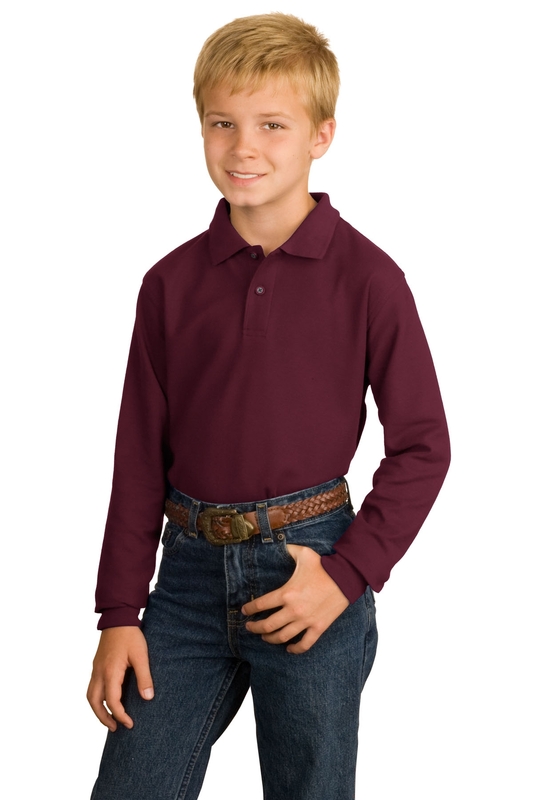 Port Authority’s Youth Long Sleeve Silk Touch Polo is the perfect attire for any young future star. Port Authority’s Youth Long Sleeve Silk Touch Polo carries a classic style which is popular all year round. It’s an impeccable item for any young child and will make them look smart and trendy while being comfortable and happy. The Polo is most suitable for schools who want to make their children easily identifiable while representing the company in an honourable manner. It is also perfect for any summer camps or sports teams. It is easily customisable with brand logos. The long sleeve is a great look and is very popular with kids who play sports outdoors, at nights or during the winter. The Polo we provide comes in range of 5 colours; Black, Burgundy, Navy, Red, Royal. The Navy is a very popular choice, when worn with cream chinos or cargo pants this young man will be the smartest, most stylish looking around, whether it be at a dinner, school or sports. This firm favourite classic long sleeve style will look good on any child. Youth sizes are as follows; XS (4), S (6-8), M (10-12), L (14-16), XL.